Same thing happaned in England . Apparently. 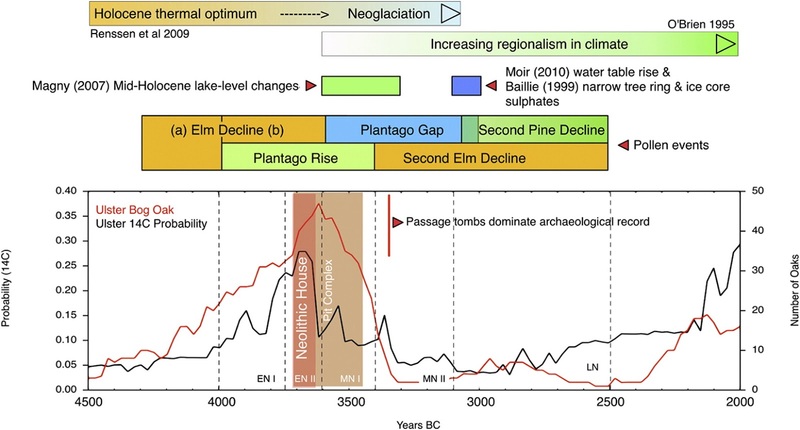 Could this massive demographic collapse that archaeologists are seeing explain the subsequent rise of R1b in Western , esp Atlantic , Europe ? 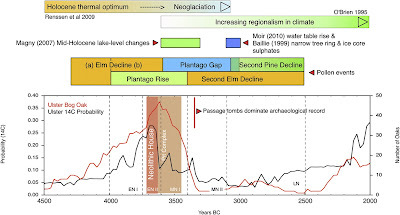 This hints at what seems the most likely genetic story: first farmer expansion during the climate optimum with a more paleolithic or mixed neo/paleo population still existing on marginal terrain followed by a population collapse when the optimum came to an end and the previously peripheral population expanding into the vaccuum. It would be interesting to know how much demographic (and cultural) continuity there was between the failed and the ultimately successful Neolithic revolutions in Ireland.